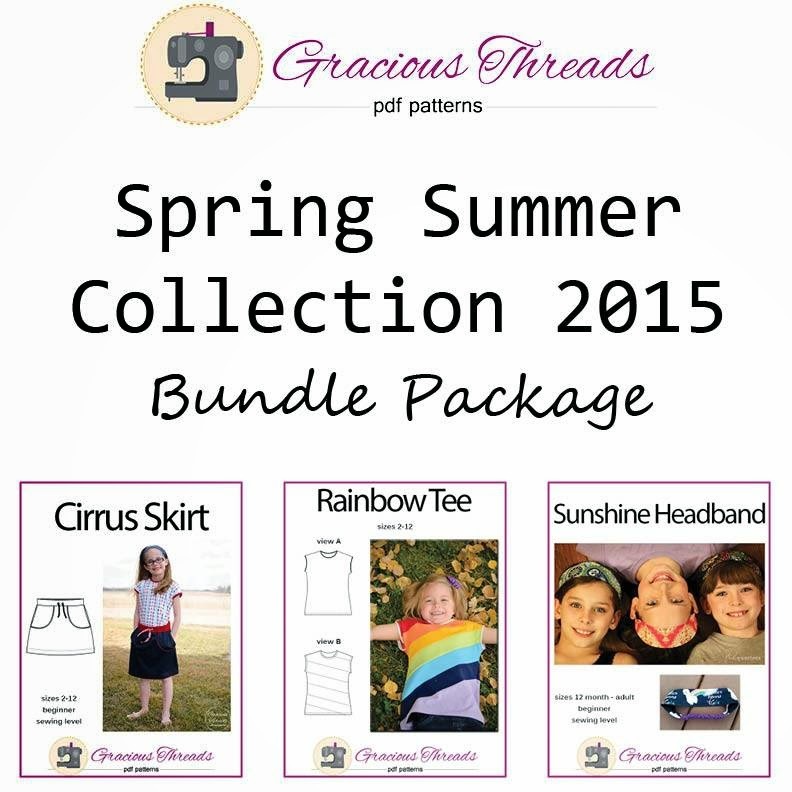 Introducing three great new patterns from Gracious Threads - the Rainbow Tee, the Cirrus Skirt and the Sunshine Headband! Great to wear as a set, but the three pieces also work brilliantly as separates too. All three of these patterns are super quick to sew up - so if you are looking for a quick new summer outfit that is cute and functional - here it is!! With great instructions and really clear images to help you along the way with each step, these really are easy patterns to sew up, even if you're new to knits. I did the simple version of the Rainbow Tee because I had this gorgeous fabric that I wanted to showcase, but you must check out the colourblocked versions on the Pattern Listing - they are so cool!! The Cirrus Skirt is soooo fast to sew - and Little B of course loves the fact that it has pockets! I used a decorative stretch stitch to top stitch the pockets and to sew the hem - you could do this in a contrasting thread to really make a feature of it. See an example of this on the Pattern Listing. Last but not least is the Sunshine Headband - this comes in sizes 12 months all the way up to adult size! It complements the rest of the collection wonderfully, but is also great to wear with any outfit. As it comes in my size, I thought it would be rude not to make myself one too! Perfect for holding my long hair out of my face! Get the pattern Here. If you would like to be in with a chance to win the whole collection - just leave a comment on this blog post and let me know - which pattern would you sew first if you won??! A winner will be picked randomly on Monday 27th April. I love what you did with that top! I just got some wonderful custom knits in the mail that I would use the top pattern to make one similar and then probably a coordinating skirt because its getting warmer out and my little girl needs some summer outfits! Oh i LOVE your fabric choices! The whole outfit is just scrummy!! I'd want to make it all, but my first project would be the Rainbow Tee for my sweet 2 year old niece. I could use one of the headbands too for working in the garden! My daughter loves skirts, so I would definately make the skirt first! I could really use some pretty headbands. My hair is crazy with the humidity we are getting right now. Of all the cute patterns, I'd try the skirt and the headband first! Cute patterns! I sew the rainbow shirt first! I'd probably sew the Sunshine headband first for my 3 girls. If little miss chooses her fabric maybe she'll wear it and keep her hair out of her eyes. I would probably sew the headband first. My oldest daughter has a pixie haircut and this would look cute on her. I would love this set! I just ordered some space invaders knit and this would be awesome for my nerdy toddler girl! Especially as we're potty training. Skirts will be a nice option to dresses all summer. Just lovely! Your sewing and your little B, too!